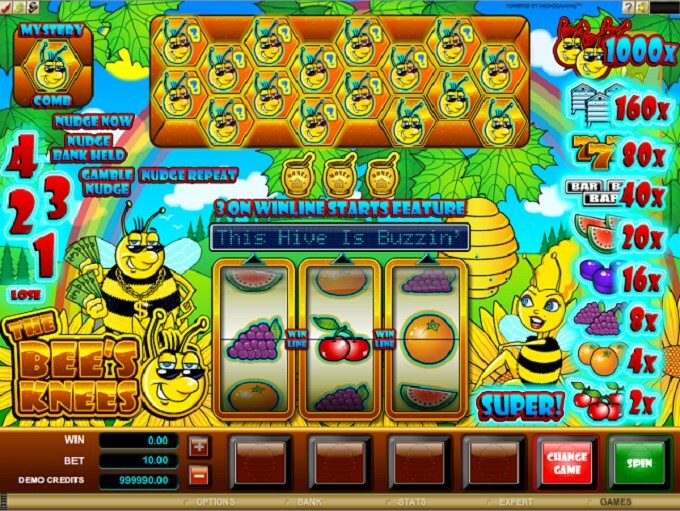 Bee themed slot machines are not unusual, but when it comes to the classic slot category I don’t remember seeing any others with a similar topic. The Bees Knees might be a 3 reel game, but it has a lot more to offer players than just a couple of simple reels with one payline. It’s one of the Microgaming slot machines which is designed to give you a lot more, and they’re always fun to explore since they’re usually quite different from one another. 3 reels, 1 line and a lot of cool bonus features are part of the experience which The Bees Knees offers you. There are various types of nudges on the line, plus a bonus game with mystery prizes of up to 2,000x. Top rewards go as high as $10,000 normally. The game’s bonus game is one big attraction point, while the mix of nudges is another one. The nudges you see on the left side of the screen, including options like Gamble Nudge, Repeat Nudge, Nudge Bank Held and Nudge Now. These allow you to hopefully get a new combo, by moving a symbol into the right position, if it wasn’t on the payline but you could see it underneath the line. The bonus game is started with the Honey Jar symbol, when three of them occupy a payline. Honey combs are placed at the top of the screen, and the mystery prizes they offer you can include things like nudges, bonus games, win spins and payouts of up to 2,000x. A single coin is sufficient to play this game, and you have no option to wager more. You select the denomination of the coin, and that’s it. The minimum value is at $0.10, the maximum is $10. As the paytable mentions, the top reward offered is at 1,000 times the bet, which in this case means a jackpot of $10,000. Nature is at the center of the action which is going on in the background of the game. You see green hills and forests, you see sunflowers, bee hives, leaves and bees which are holding cash and wearing gold chains around their necks. There are a lot of things going on at once, but that’s very typical for these modern classic slots that Microgaming designs. The symbols are for the most part classic icons, but a couple of themed icons have also found their way onto the paytable. Symbols: Bee (1,000 coins), Bee Hive (160 coins), Yellow 7 (80 coins), One Bar (40 coins), Watermelon (20 coins), Plum (16 coins), Grape (8 coins), Orange (4 coins) and Cherries (2 coins). Like many of the classic slots that Microgaming offers, it has more to offer than your typical 3 reel game, so those that aren’t looking for a very simple slot to play will like it. 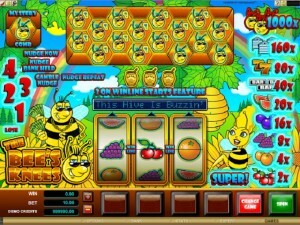 This The Bees Knees slot is offered by all online casinos with Microgaming software, playable either in practice or in real money mode.